The fish owned by Michelle Elia Evans is displayed at Sunset Bar and Grill, which has two addresses: 18 Shore Drive or 3 O'Connell Island, both in Wilson. The theme of the fish is the harbor front, along with a nod to local fishing charter Lone Wolf, and was designed and painted by elementary school students Anthony Taravella, Jackson Rotella, Faith Herlan, Isabella Schultz, Emily Kelly, Matthew Couturier, Gerry Price, Joe St. Onge, Raechel Blasius, Julia Seider, Mitchell Peck, Lucas Peck, Gerianne Rodger, and Chelsea Wheeler. Founder Reuben Wilson’s son Luther obtained permission to build two 200 foot piers at the mouth of Twelve Mile Creek, into Lake Ontario, in 1846. Soon afterwards, when Wilson was made a port of entry into the United States, vacationers flocked to the town during summers. Many would spend their days at Lake Island Park, which was located at what is now Shore Drive, near Greenwood Cemetery. There was a ball diamond, ferris wheel, water toboggan slide and large dance pavilion in the park. Today, Sunset Bar and Grill is located nearby where Lake Island Park was built. Nestled among a side hill of pines, the view of the Wilson Harbor from the patio seating and bar is simply beautiful. Sunset is now open. For reservations, please call 716-751-6868 or email: michelle@sunsetgrillwilson.com . The menu is available online. 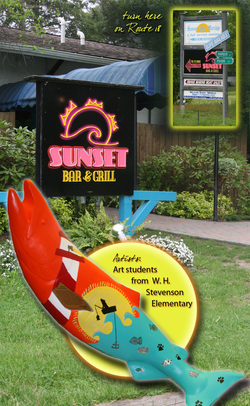 For more information about Sunset Bar & Grill, please visit: www.sunsetgrillwilson.com.